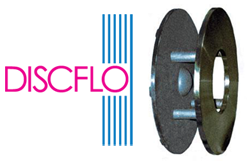 DISCFLO Pumps: Providing High Reliability, Extremely Long Life, and Peace of Mind pumping for various industries including municipal, phosphate, pulp and paper, food, power generation, waste resources, and general industry is our specialty. GPi has many years experience in solving "high maintenance" pump problems for our customers. Discover how Gerber Pumps can help you with your "hard to pump" fluids and sludge. You purchase "Peace of Mind" when you install a DISCFLO pump. From the outside they look like very robust end suction centrifugal slurry pumps in that they rotate as a standard centrifugal pump. However, internally, the unique and worldwide patented “discpac” design makes all the difference in performance of the Discflo pumps. The "Boundary Layer / Viscous Drag" pumping principles allow Discflo pumps to handle extremely abrasive and viscous- abrasive slurries and sludges with "Low-to-No" maintenance. Additionally, the pumped product is transferred in the most delicate and gentle manner due to Discflo's laminar flow "pull through" pumping principle. Discflo pumps exhibit the Simplicity of Centrifugal pumps with the Solids Handling capabilities of Positive Displacement pumps." The DISCFLO disc pump has the appearance of a centrifugal unit, but performs the work not only of centrifugals, but also progressive cavity pumps, lobe and gear pumps. It can handle flow rates from 2 to 10,000 GPM [2250 m3/h] and heads up to 1000 ft [300m]. 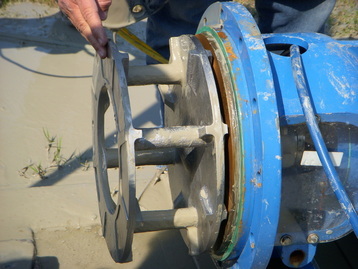 Disc pumps operate on the principles of "Boundary Layer" and "Viscous Drag". The application of these principles is new in the world of pumps but widely used in other areas of fluid engineering, such as causing friction loss through a piping system. Under laminar flow conditions, streams of liquid travel at different velocities through a pipe, with the layer closest to the pipe being stationary – known as the Boundary Layer – and successive fluid layers flowing faster towards the center of the pipe. of the Discpac, a series of parallel discs which form the pumping mechanism. As the discs rotate, energy is transferred to successive layers of molecules in the fluid between the discs via the Viscous Drag Principle, generating velocity and pressure gradients across the width of the Discpac. This combination of Boundary Layer and Viscous Drag results in a powerful force that “pulls” the product through the pump in a smooth, pulsation-free flow. The fluid being pumped moves parallel to the Discpac, so it does not impinge on the moving parts of the pump. It is this Non-Impingement and gentle Pull-Through pumping action which distinguishes the Discflo pump from other pump systems on the market, all of which use some kind of impingement device to “push” product through the pump. 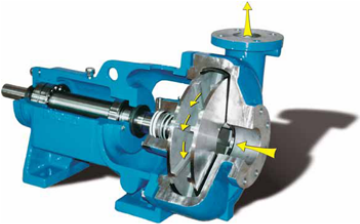 By minimizing contact between the pump and the material being pumped, wear on the disc pump components is greatly reduced, pump downtime is rare and, in the case of shear sensitive materials, damage to the product by the pump is eliminated. The disc pump’s problem-solving ability in hard-to-pump applications is unparalleled in the world of pumps... making the Discflo truly the future of pump technology.